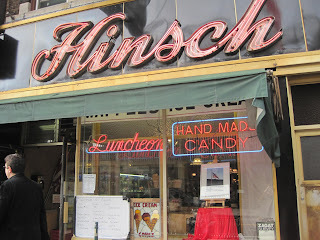 Stuff I Ate: Hinsch's Diner--Old School Eats! This place, right in my hood, offers two of my favorite things: breakfast food and sundaes! And you can leave the big bills at home--this place is DEFINITELY cheap eats! 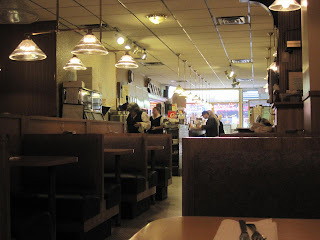 Kelli and I dragged ourselves out of our warm building one Saturday morning and walked the short distance to Hinsch's, right on 5th Avenue in Bay Ridge. 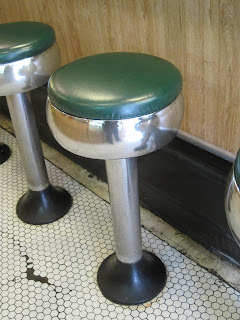 This place is old-school, cash only, vinyl stools at the bar, booths in the back, seat yourself anywhere you like. Kel & I always tend to gravitate towards the same area in the back, depending on how busy it is. This was a very late "breakfast" (past noon), so it had cleared out a bit by then that day. 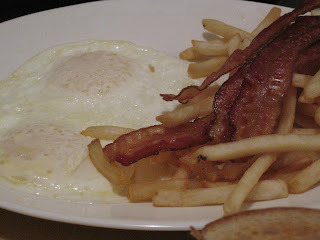 I ordered my usual--eggs over easy (my go-to when poached eggs aren't available) with bacon and home fries. The home fries are just okay, but at mere dollars per dish, it is always a good deal. 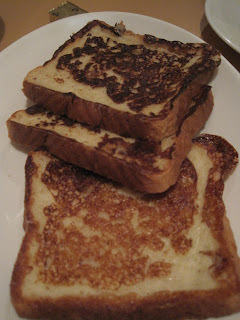 You also get toast, and Kel & I both always opt for the rye--toasted and tangy and just enough butter. I always forget to ask for a plain piece of toast so I can put some of that Welch's grape jelly on my bread (without butter, of course, I don't like mixing butter and jam). Kel opted for the same dish, but with their skinny, crispy fries instead of home fries. 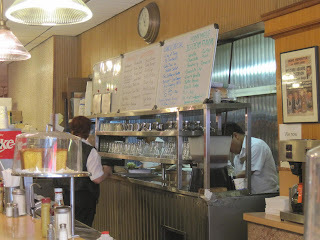 We also shared some of their old-fashioned French toast. This is sooo good! It's eggy but not too eggy, super-fluffy and super-delicious. So good. I usually only have one piece because I'm more of a savory than sweet breakfast person. Plus, did I mention the sundaes? 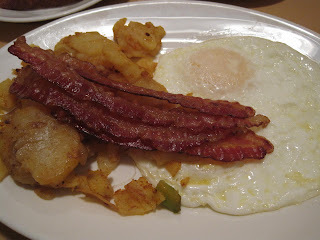 The breakfast food is good, solid fare that comes out fast. But as I mentioned, we had a greater objective in mind: sundaes!! 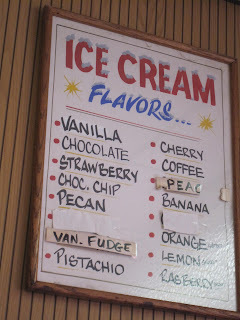 This place makes their own ice cream, their own hot fudge sauce, you name it. Kelli always gets chocolate ice cream, I always get vanilla. I also opt for both whipped cream AND marshmallow. Yeah, I said it. Live large. Kelli doesn't care for the whipped cream, but she learned long ago to give up the fight. 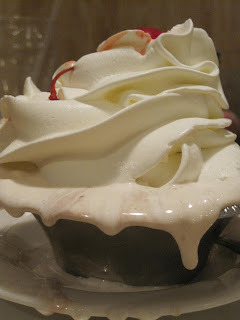 Every time she tried to get no whipped cream, the waitress's reaction was something along the lines of: "Are you crazy? It's REAL whipped cream--not the kind from a can" and the next thing you know, Kelli relents and here comes a coronary-inducing amount of whipped cream towering over her sundae. She discreetly scrapes it off once the mollified server walks away. Pick your battles, people. Notice how the marshmallow topping is driiiipping off the sides of the dish. Yum. We never finish these, but that's not the point! This is one of my favorite splurges (we really only go about once a year--it had been 18 months since our last sundae--now you know why). 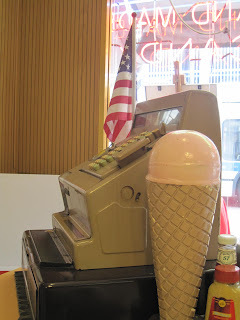 With all of our food, unlimited coffee refills, and super sundaes, our bill still came to around 10 bucks each. Awwww YEAH. 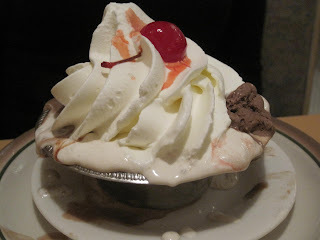 That sundae is making me drool even still with food poisoning!